University of Oregon President Michael Gottfredson testified before a legislative committee today (April 11) that an institutional governing board will help the UO keep top students in Oregon, retain valued faculty and appeal more effectively to donors. "This bill is designed to enable the university to operate more flexibly to create opportunities for Oregon students; to generate greater financial resources to support education, research and public service; and to maintain the essential public nature of the university," the UO president told members of the Senate Committee on Education and Workforce Development, which is considering the governance bill (Senate Bill 270). "I believe that it will do all of that, and that it is a landmark piece of legislation designed to enhance the public interest," he said, testifying before the committee during the biennial UO Day at the Capitol. UO Day at the Capitol is intended to inform lawmakers and others about the university's accomplishments and reach. UO programs and the university’s service to the state were highlighted through displays in the Capitol Galleria, student performances in the House and Senate, and visits with legislators. Campus groups that participated in this year's event include the award-winning UO Gospel Choir; the Jordan Schnitzer Museum of Art; the Museum of Natural and Cultural History; the Office of Research, Innovation & Graduate Education (RIGE); the Solar Energy Center; the Center for Sustainable Material Chemistry; CAMCOR; the Oregon Bach Festival; PathwayOregon; the Holden Center; and the Sustainable Cities Initiative. The House of Representatives used the UO Day as an occasion to honor Oregon Bach Festival founders Royce Salzman and Helmuth Rilling. State Rep. Phil Barnhart of Eugene, a UO alum, introduced the two resolutions, which were approved unanimously. 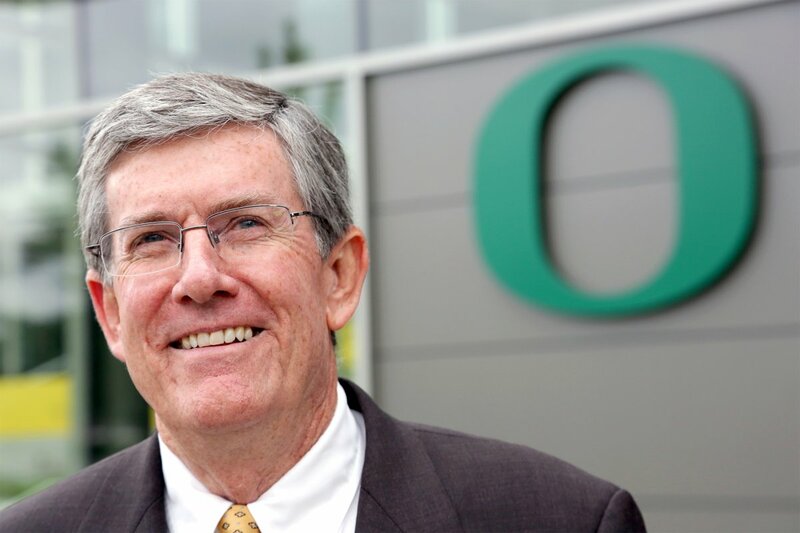 In his committee testimony, Gottfredson said UO advocates have long sought a governing board made up of members who could focus on the day-to-day needs and mission of the university. He said the boards now being considered will give greater flexibility to the Oregon universities that choose them, while still protecting the interests of other universities, acknowledging the legislature's fiscal responsibilities and maintaining "the character and traditions of public higher education." "You have done a remarkable job of combining the elements necessary to establish a true governing board for the university while respecting and responding to the important concerns raised in the process," he told lawmakers. Gottfredson said institutional board members will develop "intimate familiarity" with the university, allowing them to help develop a strategic vision for the institution. Membership of the board will provide connections to business, civic and opinion leaders throughout the state. The president said he expects members of the board to provide support and oversight for campus leaders. "Furthermore, an institutional board will allow us to tap into greater philanthropy to recruit and retain top faculty, make a UO education even more attractive and accessible to Oregon’s best students, and build state-of-the-art facilities and technology to better serve the needs of Oregonians in the 21st century," he said. Gottfredson cited the Oregon Health and Science University in Portland as an example of an institution with an institutional board comparable to what is envisioned in the current legislation. "Governed by a board structure similar to that proposed in SB 270, OHSU is justifiably one the state’s great educational points of pride," he said. On makeup of the boards' membership, Gottfredson said students now bear the largest share of their educational expenses – in contrast to just two decades ago when the state bore the largest burden – and have direct interests in the university's operation. "They expect and deserve a say in how the university is governed," he said. "We also strongly believe it is vitally important to include faculty representation on the UO board – either in a non-voting, ex-officio capacity, similar to the board status of the UO president, or as a voting member," the president said. He urged lawmakers to support passage of SB 270, and in doing so, help the university find its best path to success and achievement. "It will allow the UO to be more competitive in attracting and retaining top faculty, reduce redundant bureaucracy and accelerate administrative and capital project timelines, and improve our ability to make critical purchases of the technology and equipment needed to serve the teaching, research, and outreach missions of the university," he said.